Confession: I'm a pinterest-er. pinner. whatever. One day while pinning, I came across this cute little pin from etsy. I knew for sure I could make it for less than $35 though. 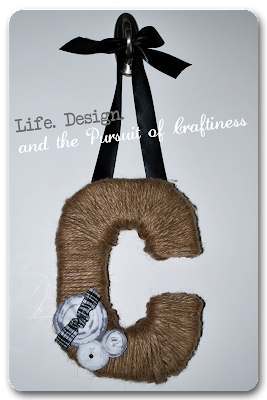 A friend and I sat down with our letters from the craft store, rolls of jute, and our hot glue guns. ...and before you knew it, voila! There's a nice little tutorial over on two twenty one if you're interested. My advice though, just use one roll of jute. This is a quick and inexpensive craft which works awesome as a personalized gift. My sister-in-law and mother-in-law both will be receiving their family's letter this year for Christmas!